Nebula Cruiser is a collaborative environment to support the development of models and analyses without the need to program. If you want to estimate and predict fatigue, tiredness and sleepiness on the basis of modeling and signal processing of physiological and behavioral time series, Nebula Cruiser can help you to achieve your goals. 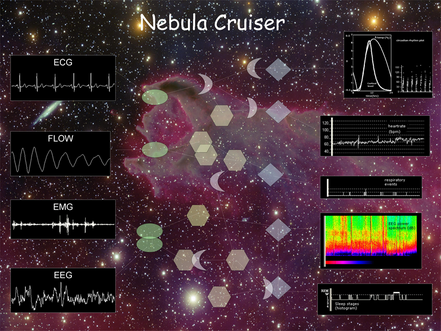 With Nebula Cruiser, a user has access to various mathematical and processing operators that can be combined in a data-flow graph to develop an 'explorer' to explore models and signal processing algorithms. With the simple and intuitive graphical interface you just draw a new analysis, using ready-made analysis building blocks from the Nebula Cruiser database. The graph works like a flow-chart or analysis specification. Programming an analysis is like drawing a graph of the algorithm. Nebula Cruiser is supported by a consortium of users.